This post is part of a series where I intend to provide additional information while attempting to illustrate the process of restoring San José Church in Old San Juan. Please refer to Part One in a previous post. The current restoration efforts at San José began in 2005 and Jorge Rigau, FAIA – Arquitectos PSC has been fully involved since 2013 a year after the Patronato de Monumentos de San Juan was established as a not-for-profit private organization to oversee and secure funds for the works. San José was occupied for almost five centuries by three religious orders; Dominicans, Jesuits, and Vincentians. The church was originally named Santo Tomás de Aquino (Saint Aquinas) by the Dominican Order, who built it as part of their convent. The structure as we see it today was the product of a series of interventions that spanned almost three centuries, up to the mid-1800s until the Dominican Order was expelled and the Spanish government seizes control of the convent. Later in the 1860s, the Jesuits took over the church and eventually renamed it as San José. During their stay, but most probably in preparation for their arrival, major interventions were performed. However, the character of these works was primarily aesthetic. One can only imagine that, in comparison to other Jesuit churches, the modest finishes under the Dominican period were too austere for their taste. Therefore, the clay floor (there are only written accounts of its existence) was replaced with an Italian marble. Also, an exuberant gothic altarpiece or retablo was installed in its main page; and all interiors were plastered, while its main vaults were ornately painted blue and decorated with stars in allusion of a cielo aperto. We know about the existence by black & white photographs of the early 20th century, as well as traces of the blue paint and brass nails that presumably held the stars were still visible in the vaults. Surprisingly, after all these efforts, the Jesuits did not stay long at Sa José. Shortly by the early 1930s the Vincentian Fathers had already made changes to the church and stayed until its closure in the late 1990s. During the process of completion of San José, multiple building materials and methods were used. For example, stone masonry construction was employed during the original sections of the church. Therefore, apse, and transept, as well as part of the main and lateral naves were built with traditional medieval stone masonry construction. (See sketch below) For the rest of the structure rubble masonry walls were employed. At some point — possibly during the Jesuit period — the northwest arch of the main nave opening towards the lateral nave was enlarged in what seems like an attempt to provide uniformity with the other arches at both sides of the space. However, while all other arches were made either in stone or brick masonry this one was reinforced with concrete, all hidden behind cement plaster. We cannot say exactly when the concrete reinforcement had been applied, but by the time we encountered, the structure had been failing due to corrosion and spalling. It was our recommendation to carefully remove the concrete and instead provide a more compatible reinforcement to the unstable rubble masonry opening. Sketch illustrating the new brick masonry arch to be erected in lieu of the incompatible reinforced concrete intervention. Explanatory sketch (with on site clarification jots) to illustrate the laying of bricks and how to (and not to) cut the bricks to articulate the arch’s corners. The articulation was a way to emulate — without copying — the profile of the medieval stone voussoirs of the existing arches. The next two photographs illustrate the process of erection of the new arch and the last image portraits the finalized brick reinforcement. Transformed several times throughout the years Plaza de Armas today is arguably one of the best public squares in Old San Juan, Puerto Rico. The current design -depicted above- is from the 1980’s and belongs to architect, Alberto del Toro (assisted by the dissolved firm Arce y Rigau). The space was last rehabilitated almost two decades ago. The works dealt with minor repairs to the pavements and sitting areas, but additional trees were added. Fortunately, the new planting followed the existing structure and a second line of trees — of the same species — was paired with the existing. For that reason, the original spatial organization devised by the designers remained unchanged. Some could argue that it was reinforced with the addition. Plaza de Armas is rectangular in shape, conformed by contiguous buildings along its four sides where two civic structures stand out, the Departamento de Estado o Real Intendencia to the West (right in the top sketch) and the Ayuntamiento or Alcaldía de San Juan to the North (center down in the sketch, also at the perspective below). It is worth noting that the space does not align with any of the afore-mentioned buildings. However, the skillful designer(s) organized the urban elements at their disposition to compensate for the ‘misalignment’. Therefore, as illustrated, a telephone cabin, a fountain and a “glorieta”, along with the mass of trees — all composed to acknowledge and reinforce — the City Hall’s main axis, perpendicular to the plaza. The mass of trees further recognize the building’s protruding arcades and the towers that flank them. 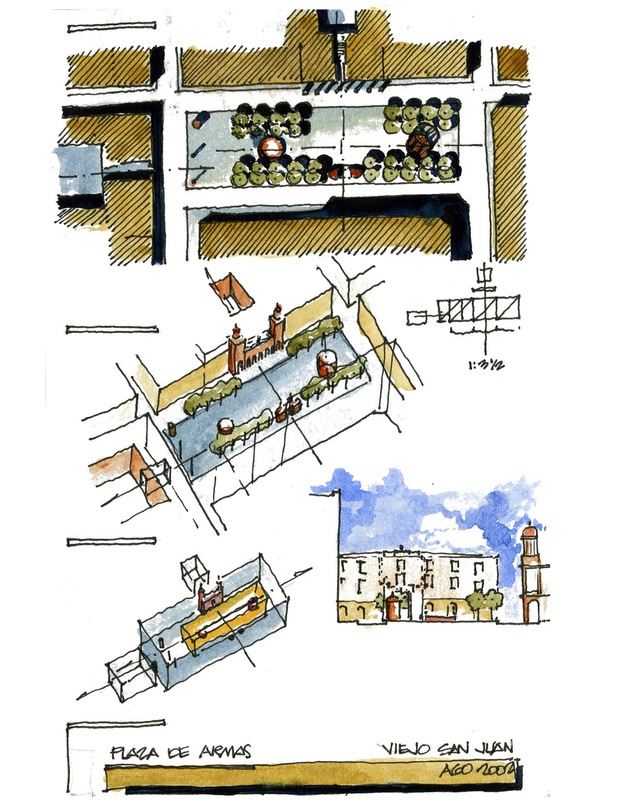 (See sketch below, illustrating this space back in 2002). The space conformed by the surrounding buildings is rectangular. 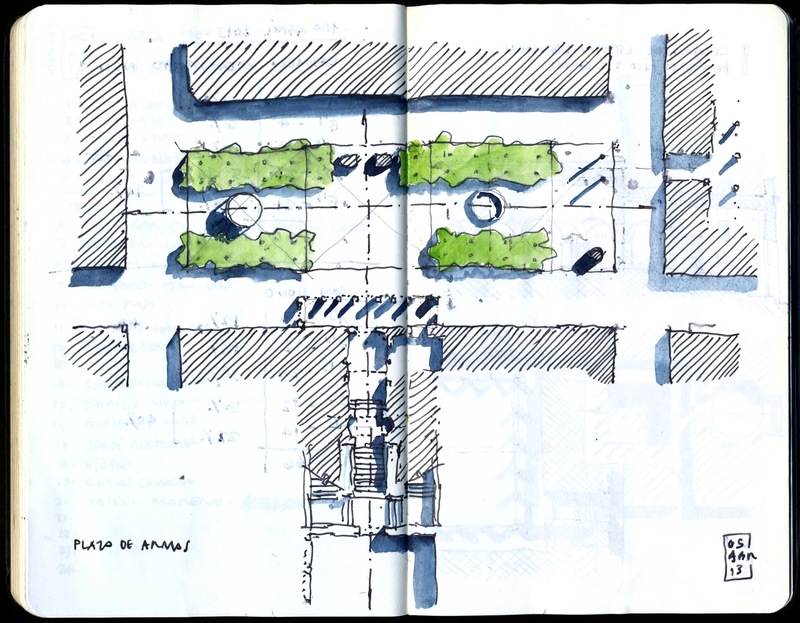 However, the space’s proportion is less important than the composition of the urban elements inside the paved area of the square. The arrangement is what really organizes the space. The paved area has a proportion of 1:3.5; one square wide by three and a half squares long. The alignment with the Ayuntamiento (as illustrated) is far more hierarchical than the alignment with the Real Intendencia. Nevertheless, two monumental light posts – no others alike are to be found in the square – recognize the Real Intendencia’s longitudinal axis. Thus, proving that neither the longitudinal or transversal axis of the rectangular geometry of the space (without relating to any structure) is as relevant as the axis created by the arrangement of elements drawn by the skillful hand of the designers.